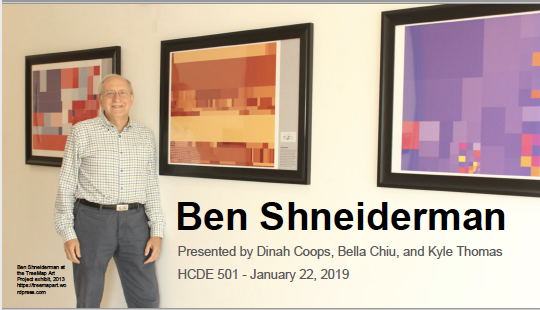 On January 22, 2019 a team of three students at the University of Washington presented the career of HCIL Founding Director Ben Shneiderman to their master’s degree class (HCDE 501 Theoretical Foundations) in the Department of Human-Centered Design & Engineering. Take a look at the slides from the presentation by Dinah Coops, Bella Chiu, and Kyle Thomas. Their presentation adapted the newly installed timeline on Shneiderman’s website to show the highlights of his career and recognitions. To suit their course, the students emphasized the five kinds of theories: Descriptive, explanatory, predictive, prescriptive, and generative that Shneiderman described in his book with Ben Bederson The Craft of Information Visualization. The students covered the 8 Golden Rules and the 12-part taxonomy of interactive dynamics for visual analytics (written with Jeffrey Heer, UW Prof). Their class project also included two new sections in Shneiderman’s Wikipedia page. Coincidentally, two of the students work for Spotfire (TIBCO), a successful commercial information visualization tool that grew out of HCIL research in the 1990s.